Here at MW Video Systems, we’re seeing in the new year with a set of new brochures for 2017. 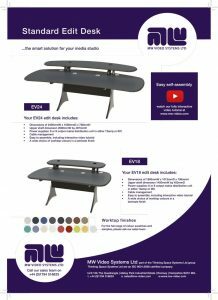 First up is our Edit Desk leaflet, updated from the previous version, to include the latest offerings for standard edit desks. These desks are our speedy solution for getting your media studio up and running, and our handy YouTube video helps with self-assembly. Offering two sizes of desk, we also offer a variety of worktop colours as well as desktop accessories to compliment your workspace. The latest addition to the accessories range is the Novus TabletSafe, a secure way of storing your tablet in your studio, which can be mounted in a variety of ways. In addition, we are set to launch our brand new product line at BVE London later this month with the leaflet detailing the following new concept. We are looking forward to introducing our brand new height adjustable edit desk to you. After listening to our customers requirements, we have developed a solution to create an ergonomic desk which is electrically operated by the user to enable sit/stand working practices. We’d love to hear your views on the new desk, so please drop by our stand M30 from 28th February until 2nd March at BVE London, or download our leaflet to learn more. Next is our updated product brochure for 2017. Highlighting recent additions to the MW Video technical furniture range, you’ll find brand new product images and examples to refresh the information. 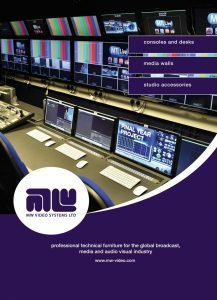 Download a copy of the new MW Video Systems Brochure 2017. Copies will shortly be available in print, so grab your copy from us at the BVE show, or request a copy to be sent out to you. We’d love to hear what you think of it!